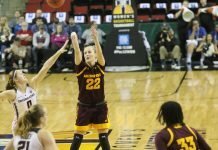 Aliyah Mazcyk defends Marie Gulich. Photo courtesy of Oregon State Athletics. 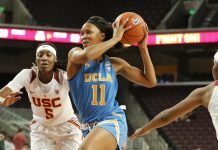 Oregon State officials are investigating a USC basketball player’s allegation that Beaver fans yelled racial slurs at her and her teammates as they left the court after a game Sunday. 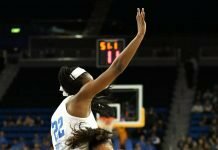 Sophomore guard Minyon Moore’s tweets about the incident were widely-seen before she deleted them. Both schools say they are working together through the probe into the incident. “Oregon State University officials are aware of this matter and are investigating it fully. We take this matter most seriously,” Oregon State University vice president Steve Clark said. USC Senior Woman Administrator Donna Heinel made a similar statement. 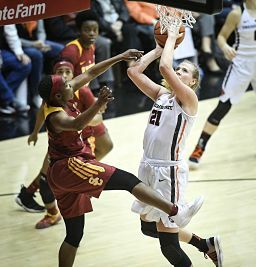 The Beavers beat the Trojans, 69-63, in a physical game that had NCAA Tournament implications for the No. 15 hosts. Has the WNBA finally settled on a marketing strategy?